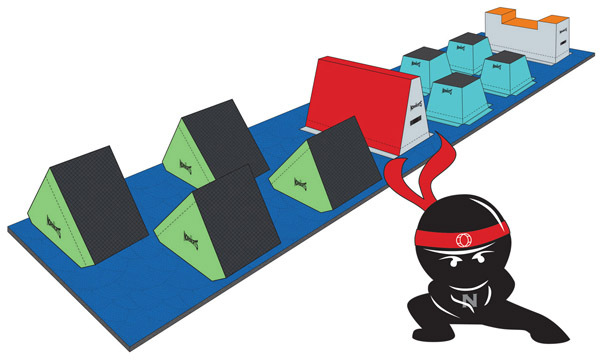 Martial Arts, Stunts & Ninja - Ninja Obstacle Course - Norbert's Athletic Products, Inc.
Our amazingly portable, infinitely configurable Ninja Obstacle Course package consists of 10 obstacles which easily and securely attach to carpet bonded foam with strategically placed hook fastener strips. Obstacles are covered with rugged 18 oz. CPSIA compliant vinyl and filled with polyurethane foam sandwiched between crosslink for optimal footing.